Metamorphin' Fusion Chess is a hybrid of my games Metamorph Chess and Fusion Chess. As in Metamorph Chess, pieces may transform into other pieces. As in Fusion Chess, pieces may merge together or split apart. Although this is a hybrid game, it has a unique feature which sets it apart from its parents and from all other Chess variants I know of. It is possible to generate new pieces in this game. This is accomplished through the process of promoting to compound pieces (from Metamorph Chess) and splitting the compound pieces into their components (from Fusion Chess). Through the repetition of this process, more and more new pieces can be added to the game. However, your opponent will likely try to stop you from generating new pieces. So your ability to generate new pieces will often function more as a threat than as an actuality. Nevertheless, just having the ability to generate new pieces, even if it is never used, adds to the game a whole new set of gambits and tactics. A regular 8x8 Chess board, all the regular Chess pieces, and other pieces for Marshalls, Paladins, Popes, Dragon Kings, and Eques Rexi. 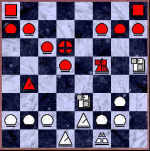 Alternately, the game can be played entirely with regular Chess pieces, with pairs of simple pieces used for compound pieces. Doing it this way will make the combination and division of pieces much easier to handle, and it doesn't require anything but the regular equipment. At startup, replace the Queen with a Rook/Bishop pair. You'll need an extra Chess set for the extra Rook and Bishop. The initial setup for Metamorphin' Fusion Chess is exactly the same as for regular Chess. So there is no need for a diagram. When a simple non-royal piece (Knight, Rook, or Bishop) is attacked, it may promote to a compound piece by moving to an empty square. Knights promote to Queens [B+R]. Bishops promote to Paladins [B+N]. Rooks promote to Marshalls [R+N]. When a non-royal compound piece (Queen, Marshall, Paladin) captures a piece, it demotes to the simple piece it just moved as. If it captured by moving diagonally, it demotes to a Bishop. If it captured by moving orthogonally, it demotes to a Rook. If it captured by jumping as a Knight, it demotes to a Knight. When a royal compound piece (Pope [K+B], Dragon King [K+R], or Eques Rex [K+N]) captures a piece, it demotes to a King. A simple piece (King, Knight, Bishop, or Rook) may combine with another non-royal simple piece by moving onto its square. The combined piece is the piece which moves as either of the two pieces just combined. A piece may not combine with another piece of the same type. Knight + Knight = Rook + Rook = Bishop + Bishop = Illegal. A non-royal piece may not move to combine with a King, but a King may move to combine with a non-royal piece. A piece may combine only with a piece belonging to the same player. Compound pieces may not combine with other pieces. A compound piece may split into its components by moving one of its components to an empty square. A Rook which separates from a piece must move away as a Rook moves. A Bishop which separates from a piece must move away as a Bishop moves. A Knight which separates from a piece must move away as a Knight moves. A King which separates from a piece must move away as a King moves. The compound piece is replaced by the component which doesn't move away. Pawns may promote to Rook, Bishop, or Knight, and not to any other piece. The object is to checkmate your opponent's current royal piece, which may be a King, Pope, Dragon King, or Eques Rex. King The King moves one space in any direction, but may not move into check. The King is one of four possible royal pieces which a player may have. A King may merge with a Bishop to form a Pope, with a Rook to form a Dragon King, or with a Knight to form an Eques Rex. If any one of these pieces gets checkmated, you lose. Pope The Pope moves as a King or Bishop, but may not move into check. The Pope is a royal piece and is formed when a King merges with a neighboring Bishop. When the Pope is on the board, it is the player's only royal piece, and the game is lost if it is checkmated. The Pope may split into its components by making a non-capturing move with one of them. If the Pope captures a piece, it turns into a King. Dragon King The Dragon King moves as a King or Rook, but may not move into check. The Dragon King is a royal piece and is formed when a King merges with a neighboring Rook. When the Dragon King is on the board, it is the player's only royal piece, and the game is lost if it is checkmated. The Dragon King may split into its components by making a non-capturing move with one of them. If the Dragon King captures a piece, it turns into a King. The name for this piece is borrowed from Shogi. Eques Rex The Eques Rex moves as a King or Knight, but may not move into check. The Eques Rex is a royal piece and is formed when a King merges with a neighboring Knight. When the Eques Rex is on the board, it is the player's only royal piece, and the game is lost if it is checkmated. The Eques Rex may split into its components by making a non-capturing move with one of them. If the Eques Rex captures a piece, it turns into a King. The name is Latin for Cavalier King. Knight The Knight moves as the Knight in Chess, jumping in an L shape, two spaces forward and one to the side. A Knight may merge with a Rook to form a Marshall or with a Bishop to form a Paladin. When an attacked Knight moves to an empty space, it promotes to a Queen. Rook The Rook moves as the Rook in Chess, any number of spaces orthogonally. A Rook may merge with a Knight to form a Marshall or with a Bishop to form a Queen. When an attacked Rook moves to an empty space, it promotes to a Marshall. Bishop The Bishop moves as the Bishop in Chess, any number of spaces diagonally. A Bishop may merge with a Knight to form a Paladin or with a Rook to form a Queen. When an attacked Bishop moves to an empty space, it promotes to a Paladin. Queen The Queen moves as the Queen in Chess, any number of spaces in any single direction. The Queen is a combination of Rook and Bishop. It may separate into its components by moving one of them to an empty space. When a Queen captures a piece, it demotes to the kind of piece it just moved as. If it captured by moving orthogonally, it demotes to a Rook. If it captured by moving diagonally, it demotes to a Bishop. Marshall The Marshall moves as a Rook or Knight. The Marshall is a combination of Rook and Knight, and it may separate into its components by moving one of them to an empty space. When a Marshall captures a piece, it demotes to the kind of piece it just moved as. If it captured by moving orthogonally, it demotes to a Rook. If it captured by jumping as a Knight, it demotes to a Knight. Paladin The Paladin moves as a Bishop or Knight. The Paladin is a combination of Bishop and Knight, and it may separate into its components by moving one of them to an empty space. When a Paladin captures a piece, it demotes to the kind of piece it just moved as. If it captured by moving diagonally, it demotes to a Bishop. If it captured by jumping as a Knight, it demotes to a Knight. Pawn The Pawn moves as the Pawn in Chess. It moves forward one space, but is allowed a double move on its first move. A Pawn captures by moving one space diagonally forward. If a Pawn makes a double move to a space alongside an enemy Pawn on its fifth rank, the enemy Pawn may capture it by en passant. Upon reaching the last rank, a Pawn may promote to a Rook, Bishop, or Knight. It may not promote to any royal or compound piece. Use algebraic notation as you would for Chess. Use P to denote Paladin and M to denote Marshall. Denote Pawn moves without the use of any letter to identify it. When a piece merges with another piece, follow the move with = and the abbreviation for the new piece. For example, R a4 - d4 = M indicates that a Rook moved from a4 to d4 and merged with a Knight on d4 to form a Marshall. When a piece separates from a compound piece, identify the move as belonging to the piece which moves away from the compound piece. Follow its move with a semicolon and identify what piece is left behind. For example, R a4 - d4; a4 = N indicates that a Rook moved to d4, separated from a Marshall at a4, and left a Knight behind at a4. If you have Zillions of Games, you may play Metamorphin' Fusion Chess on your computer. In March 2001, the graphics and audio were updated. Pictured on your left is the new board used with Zillions. It was made from computer generated textures. In April 2001, the code was optimized by removing redundancies in the code that had slowed down Zillions. It should now play the game significantly better.